[German]Microsoft has made changes to the policies for USB media that affect Windows 10 version 1809 and later. The policies for USB media are now set to ‘Quick Remove’ by default. Windows 10 V1809: Does proxy.pac kills startmenu search? [German]A brief question to admins in enterprise environments using Windows 10 V1809 in combination with a proxy.pac. Are there issues with the Windows startmenu search hanging when a proxy.pac configuration file is used? [German]The recently released cumulative update KB4490481 also fixes various issues with group policies and adds further group policies in Windows 10 V1809. Here are a few details. [German]Microsoft has released the cumulative update KB4490481 and a Servicing Stack Update KB4493510 for Windows 10 V1809 on April 2, 2019. KB4490481 is an optional update. 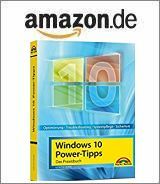 [German]Shortly before the release of Windows 10 V1903 (guess, we will have it sometimes in April), Microsoft took an unexpected move and declared Windows 10 V1809 ready for ‘wide use’, i.e. ‘business ready’.